USP 671 provides standards for the functional properties of packaging systems used for pharmaceuticals and dietary supplements. Mecmesin torque testers or torque testing systems can be used to secure closures to the torque specified in the standard. 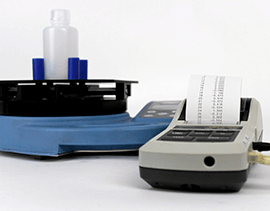 The performance testing of the samples requires other apperatus not supplied by Mecmesin. A calibrated manual torque meter capable of indicating clockwise and counter-clockwise torque capable of resolving reading to better than 5% of the nominal range of the measuring cell. 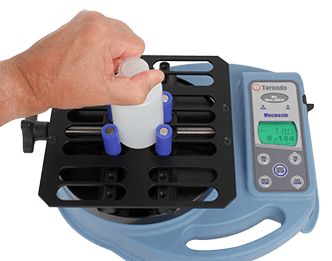 Alternatively, a motorised torque measuring system is capable of delivering greatly increased repeatability and can be used to automate the testing, increasing throughput. Select sufficient new, empty containers and clean the sealing surfaces with a lint-free cloth. For testing multiple-unit containers for Solid Oral Dosage Forms, close and open each screw-capped container 30 times, applying the torque specified in the standard. This overview is intended to provide a basic understanding of the test procedure and suitable equipment to meet the standard. Please refer to the latest official USP Pharmacopeial Convertion website for more detailed information. The following closure torque table indicates the cap application tightness range for testing the container performance. a. The torque designated for the next larger closure diameter is to be applied in testing containers having a closure diameter intermediate to the diameters listed. b A suitable apparatus is available from SecurePak, PO Box 905, Maumee, Ohio 43552-0905; www.secure-pak.com. 3) 0–100 inch lbs., read in 5-inch lb. increments. For further detail regarding instructions, reference may be made to “Standard Test Method for Application and Removal Torque of Threaded or Lug-Style Closures” ASTM Method D3198, published by the ASTM International, 100 Barr Harbor Drive, P.O. Box C700, West Conshohocken, PA 19428-2959.